It is always a sad day when a young mother dies, It is even more sad when she dies needlessly at the hands of medical malpractice. Far too many times this is happening in Liberia. Blessing was only 21. She had a C-section which was probably not even needed. Those with her said, Baby Jeremiah was already visible when the C-section began. 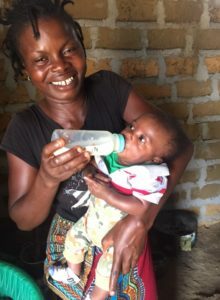 The rural clinic kept Blessing for weeks after her delivery. 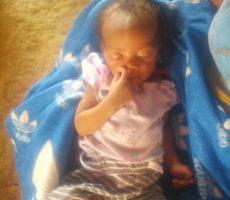 She developed postpartum sepsis. Her pain was intolerable. Blessing often didn’t have the strength to feed Jeremiah. 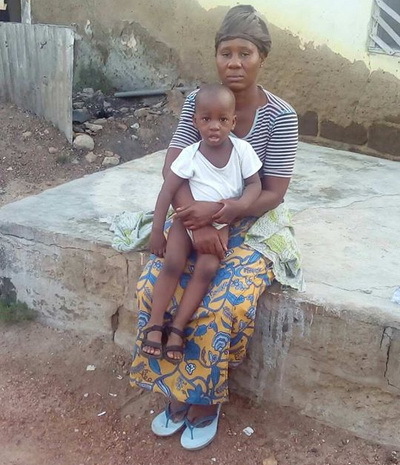 By the time Blessing was rescued from the hands of this substandard clinic, her infection was out of control. As soon as staff at Provision of Hope were notified, they rushed her to the ELWA hospital by taxi. We have few ambulances so that was not possible. ELWA did a surgical repair of the stitches. They found instruments left inside, The surgery was successful, but during the night Blessing died. 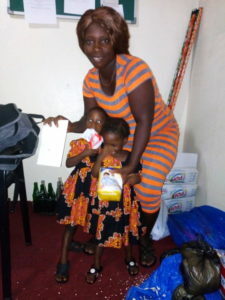 Mother who raised Blessing now takes care of Christian the 5 yr. old and Baby Jeremiah. They are poor themselves but they have a heart of love and want to see these children grow strong. Reeves and his wife are trying their best. Reeves is a school teacher making a very low salary in a rural school. 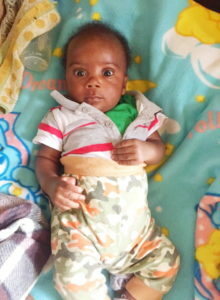 Baby Jeremiah after a month on fortified formula! 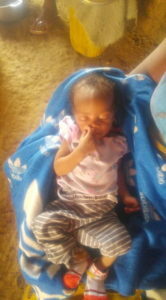 Baby Jeremiah is in the hands of a very loving mother. Christian is wearing his new clothes and new shoes! He is holding an armful of jeans, shirts, under wear, socks etc. He never had this many new clothes at one time I am sure!! Thank you Kula Harris for doing the shopping! 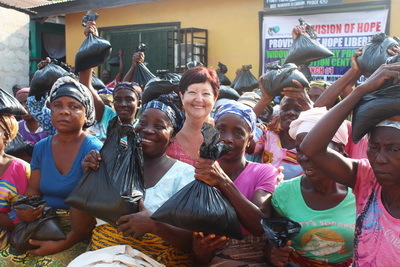 Provision of Hope plans to continue supplying their formula. A case of 12 tins lasts for over a month and a half. The cost is $ 65 US. Christian is in Kindergarten. 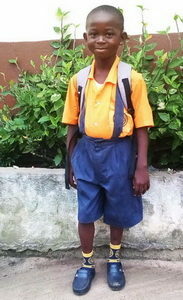 We are trusting for funds to continue his schooling. 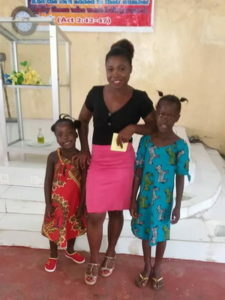 Thank you to Felecia Wiebe ( our Liberian daughter) who notified us of this extreme need and for raising the money to get Blessing’s body released from the hospital for burial. Thank you to all these donors. All hospital bills need to be paid before they release the body. Thank God Blessing could have an honorable funeral. Thank you to Daniel Zulu who is a neighbor to the Reeves’ family and helps tremendously! Thank you to those who have already donated and to anyone who might wish to help us continue this work. This story is only one example of the many stories we could be posting. God is faithful to provide through our generous donors! EMMANUEL GIBSON CONGRATULATIONS! WELL DONE!! 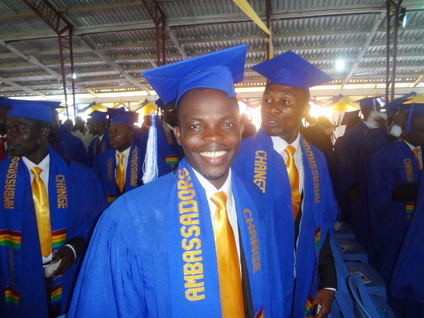 Emmanuel Gibson graduated on March 3rd with a BA in Theology from the Maranatha University College in Ghana. This is a dream come true! Emmanuel worked hard to achieve this goal! He did remarkably well in his grades too. His thesis was put up in the school library. Mama Karen first met Emmanuel in 2008. 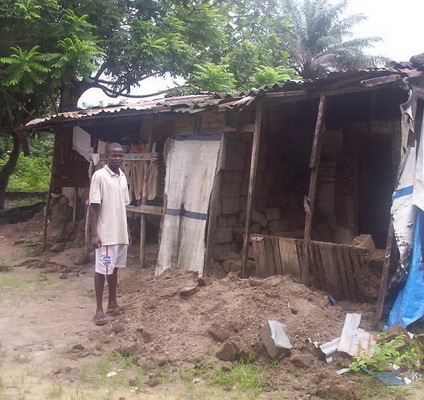 Here he is standing in front of his Aunty’s home in Liberia. He came from extreme poverty. Provision of Hope funded Emmanuel through high school. 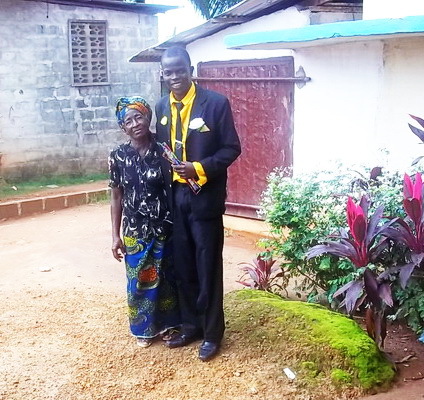 This was Emmanuel standing with his Aunty on his High School Graduation Day! 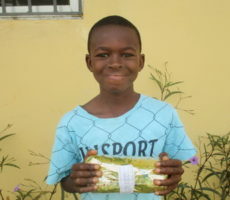 Thank you to Lucy Martens of Steinbach, MB who started sponsoring him to make this journey all possible! 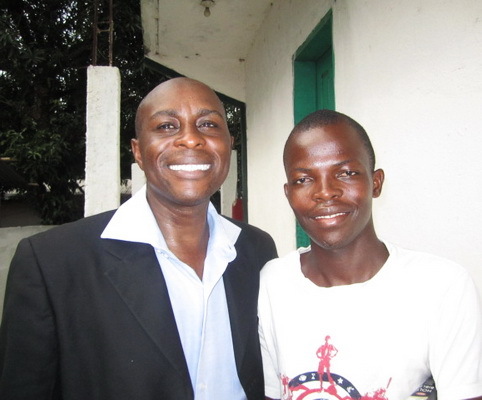 Apostle Samuel Mwangi came to Liberia and met Emmanuel in 2011! 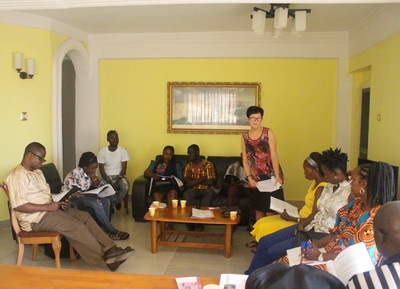 Samuel runs a school of ministry in Kenya through Bethel, School of Supernatural Ministry. After high school Emmanuel went to Kenya to attend this school. 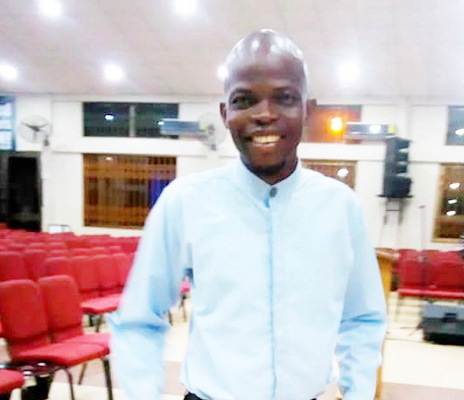 After Kenya, Emmanuel came to Ghana. We rented a room for him at the Buduburam Refugee Camp. 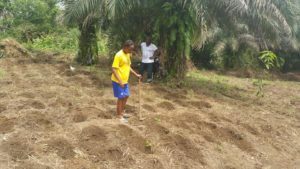 He soon became one of Provision of Hope’s leaders in Ghana. 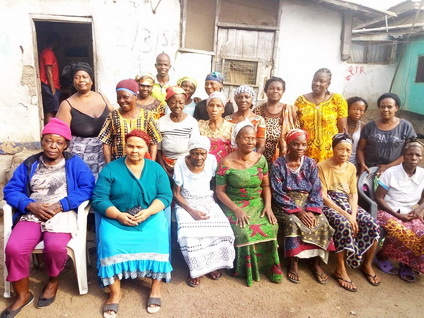 This is Emmanuel meeting with the widows. He has a heart to help others who live in poverty. 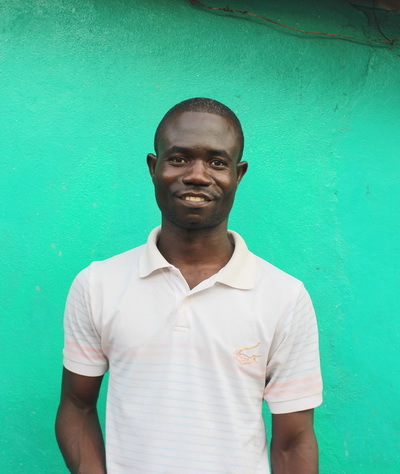 Emmanuel is our financial treasurer in Ghana at the camp. 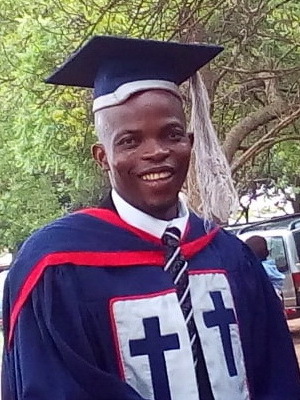 In 2014 Emmanuel Graduated with a Diploma in Theology from the Assemblies of God Southern Ghana Bible School. In his breaks he was always at the Refugee Camp, ministering with the youth and helping in the church. Emmanuel has a strong gifting to teach and preach the word of God. He is a man of prayer! Tonight he is preaching at Winners Chapel International, the church he attends. 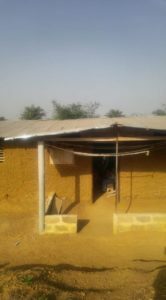 This is a large church in Ghana. The topic he was given is ” The Mystery of Faith” I know he will do well! 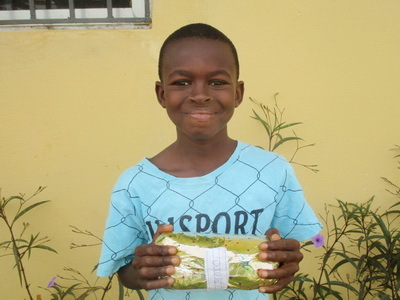 Emmanuel is always an advocate for those in need. In the midst of the large churches he is asked to preach and teach at, I am confident that will never lose His Heart for the Poor. He still lives on the Buduburam Refugee Camp. We are asking God, “Where does he go to from here?” God knows! 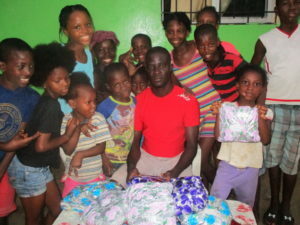 What a wonderful two weeks we had in Liberia! We saw so much progress! 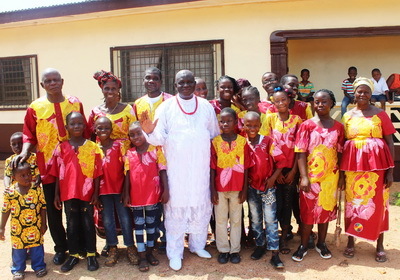 One of our greatest joys is seeing the children in our homes and spending time with them. Knowing how well they are cared for and loved makes the effort so worth it. A big thank you to our parents who run the homes and to all the donors who help support our children and other projects. It’s through your giving that all this is possible. We also have an amazing staff on the grounds who are so devoted and diligent. This is Otis and his children just before the wedding. I was so thrilled that they postponed the date so I could attend. As the “traditional” wedding ceremony proceeded they announced that they were officially welcoming me into their family! Therefore, I needed to be taken out and dressed in their family dress. I felt so honored to be a part of this wedding and so happy to see the children so excited to see their dad getting married. Otis and Benetta are so well suited for each other. Benetta lost her husband too several years ago. I know Benetta will bring a lot of joy to Otis and to this home. She’s a strong Christian and loves children. Benetta is a blessing! 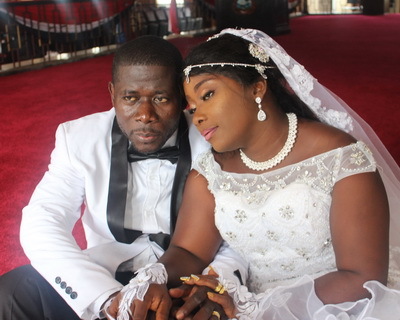 Daniel and Pinkey Keamue had a beautiful wedding on February 2nd. What a joy to be at their wedding as well. Daniel has been our accountant since 2005. He is so faithful and will make an exceptional husband for Pinkey. 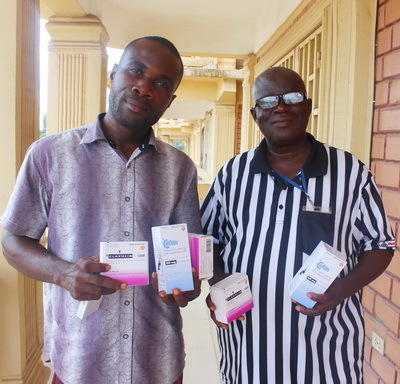 We took medical drugs to Dr. Hena at Waterfield Primary Health Care Centre in Kakata. Dr. Hena has a heart of gold and goes the extra mile to help the poor who cannot afford treatment. We get these medicines from HPIC through a donation of $675 for every 50 pound box. Their approx. value is $ 6,400. 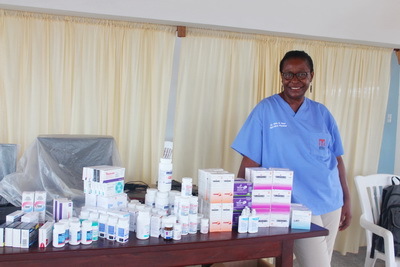 We bring medical drugs in that are hard to find in Liberia, and are a very good quality. Andrew Wallace and Otis Dyega are both nurses, who also got some of the medical supplies for our Children’s Homes. 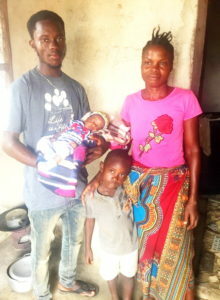 Andrew and Rose are on our program too as Hope Home Parents taking care of children who have no parents. 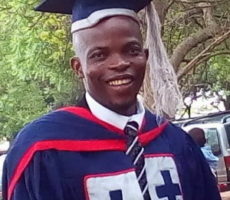 Provision of Hope funded Andrew through university to get his BN degree. Rose will be graduating with a degree in Nursing this year too! We are so proud of all our Hope Home Parents! They value each child in the same way we do. ” God has no orphans, he only has sons and daughters!” We gathered everyone for training and discussions on how things are going. In our Parent’s Meeting we introduced ” Character First” Education. This is a course placing a high value on building future leaders of character. Each home received a copy of 30 lessons that are so practical to teach kids. These are lessons on Honesty, Kindness, Respect, Obedience, Gratefulness, Self-Control, Forgiveness, Creativity etc. We talked about ” Parents being the best role models! 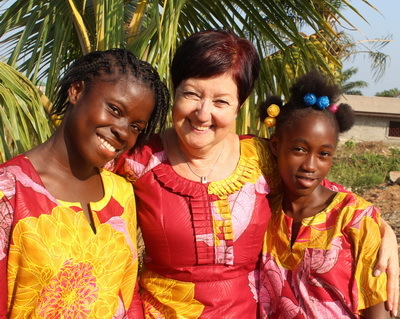 Kristine Riley shared her latest Henrietta Book ” The Heart of Africa’s Garden” with the Bridge of Hope Girls School. 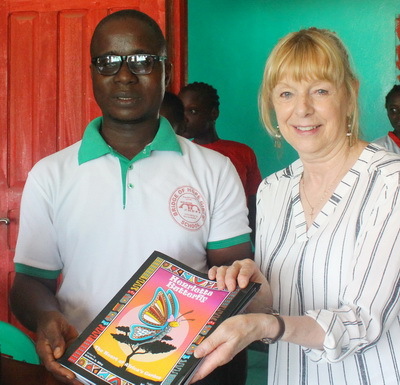 This is a photo of Emmanuel Juah one of the teachers receiving copies of the book for their library. Kristine shared her story and left 100 books in the hands of so many parents for their children and students to read. Visit her website if you would like a copy. Kids love her books!! Wedding bells will be ringing in Liberia this February! Daniel Keamue is getting married to Pinkey Ward on February 2nd! I am so excited to be present at this wedding! Daniel has been doing our accounting since 2005! He has a Bsc in Business Management. 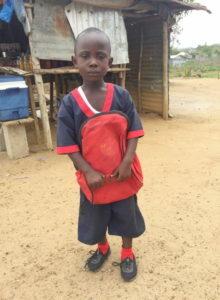 Provision of Hope funded his schooling. Daniel has served faithfully. I am so happy for him to have found his wife! Pray for the Favor of the Lord to be on this Special Day! If anyone would care to donate towards this wedding I know it would be a huge blessing to them. There are still costs to cover. Pinkey has children she takes care of, so this will be an added responsibility for Daniel as well. He will make a super great dad! The second wedding will be Mr. Otis Dyega getting married to his fiancee Benetta Saywrayne! They too are very excited about this day. I am thrilled that they postponed their big day so I could attend! 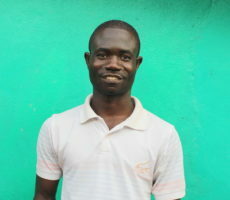 I met Benetta on my last trip to Liberia. She is so suited to Mr. Otis and she loves children. Otis lost his wife in 2012 through a sudden heart attack. Benetta has been a widow for several years too. See the budget for their wedding at the bottom of this post. 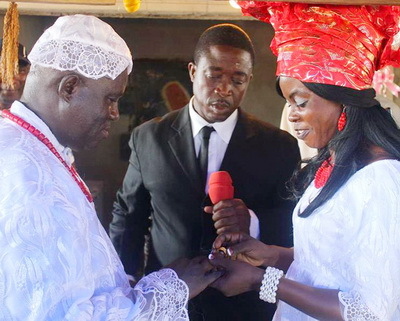 We know finances are tight for weddings in Liberia. I do hope to honor both couples with some kind of help. Otis is the dad in our Children’s Home in Buchanan. He is one amazing dad who cares for his children well and teaches them to be responsible. They are taught to have a strong faith in God. These are well disciplined children who take their school work very seriously. This wedding will be more of a traditional kind of wedding. Otis is hoping that we can help him with a contribution towards his costs. This is often why couples in Liberia will live together rather than get married, because even a traditional wedding is expensive for them. Please join me in praying for these couples as they do the last minute preparations for their weddings! I am invited to pray a PRAYER OF BLESSING over each couple at their wedding! What an honor!! Pray for Kristine Riley and I as we journey to Liberia. We leave January 27th. This will be my 12th Trip to Liberia since first going in 2003. Kristine Riley is on her 4th trip! She’s a close friend and great person to travel with. 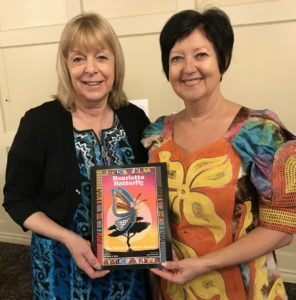 Kristine Riley is the author of a number of children’s books in the series of Henrietta the Butterfly! She just finished her last one called ” The Heart of Africa’s Garden” The kids will certainly LOVE this one! Click on the highlight to see more. We are taking medical kits again and have “so” much luggage! Email me if you would like to be put on my prayer network for this trip. Prayer is so powerful! Angela Davis’ mother Annette Wieler is meeting up with us in Frankfurt. Pray all goes well for her too. She is the brave one, traveling alone! 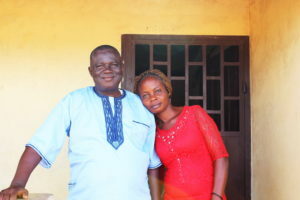 Annette is going to see her daughter and son-in-law Emmanuel who just moved to Liberia this past September! They are there as missionaries for 4 yrs. engaged in Church Renewal. I can’t wait to see them too!! Thank you to EVERYONE for your generous giving! 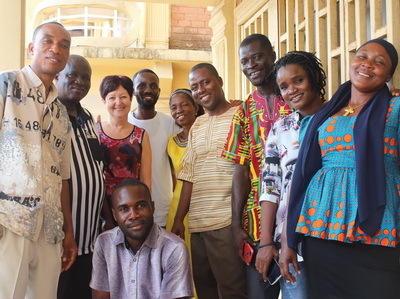 My heart is full of gratitude for the many who give so faithfully to our work in Liberia! I pray a bountiful blessing back on you and your families in 2019! 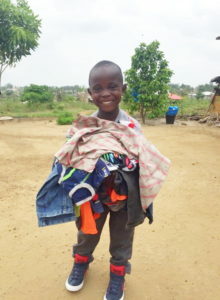 All the children in our Homes got new clothes at Christmas. They were thrilled. 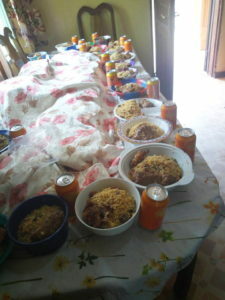 They had special food to eat which made this day extra special. 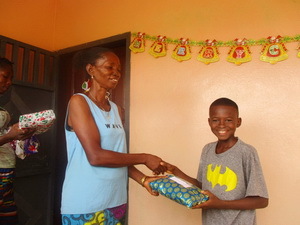 Ma Esther is giving David his Christmas Gift! All her children got wrapped presents. 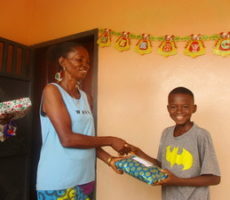 It was a special Christmas for Ma Esther having her son Emmanuel and his family home. She had her whole family together for the first time in years! 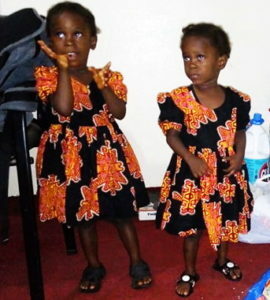 Eric and Kamah’s Children were so excited to open their gifts on Christmas Day! Kamah was up very early Christmas morning to prepare all this delicious food! Our widows got extra rice for Christmas. We could add extra oil, onions and soap. 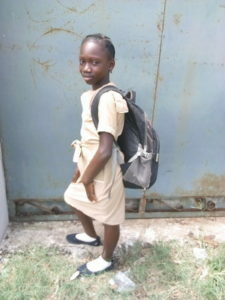 Students like Ruth would not have the funds to go to school without being sponsored. We are thrilled that we were able to register over 125 children to school again this year! 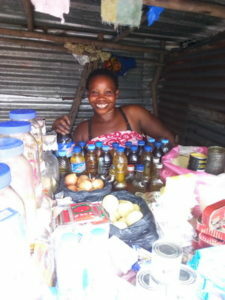 Your giving made it possible for this Single Mother to get a small business selling fish. Now she can put food on her table for her children, and buy clothes for them to wear. This field is ready for seeds and seedlings which we will be purchasing. Often farmers have land but they lack seeds and the tools to work the soil. Provision of Hope provides seeds and tools for passionate hardworking farmers. We are looking forward to expanding our work in 2019 as God continues to Provide! Or click on the topic that interests you most. It’s your giving that makes our work possible … Thank you so much! 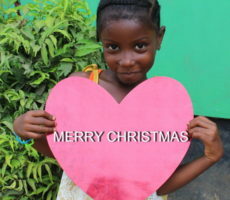 Merry Christmas from Liberia !! May you all experience the “Presence” of Jesus in a most special way as we celebrate Him! 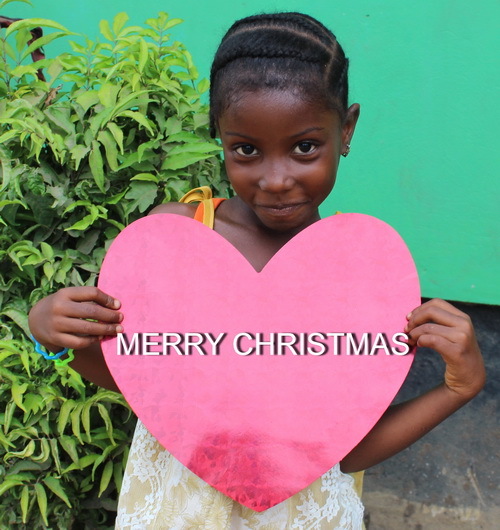 Merry Christmas from Liberia to Each One of you!! 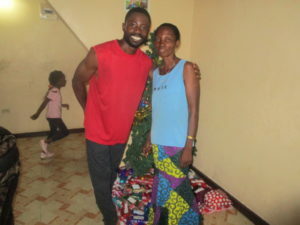 So many of our friends in Liberia are asking me to pass on a Merry Christmas to each of their sponsors and to all who so generously give through the year! “Whoever is kind to the poor lends to the LORD, and he will reward them for what they have done.” Prov. 19:17 is a promise for you! Exactly one month ago we had the tragic news that Abel Smith suddenly passed away. This news left us all in shock! Abel Smith lived with us in My Father’s House in 2005 until he graduated from high school. He went on to university through the help of his faithful sponsors Bob & Doris Bieberdorf who were also like parents to him. Abel grew up as an orphan boy. Later he met Tenneh David. She is now a single mother left with 3 children to care for. We are all finding this so sad! Tenneh with her 3 small children standing with Daniel Coleman and Daniel Keamue who represented Provision of Hope’s family at the funeral. Thank you Daniel Keamue for the tribute you gave on behalf of all of us. Today Daniel Keamue, our accountant, emailed me to say that Tenneh’s rent is due. The amount is $ 240 for the entire year. 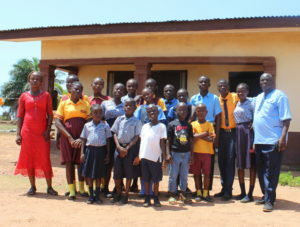 Lovetee and Prince, (her school children), in the photo above, have a balance owing with their school fees of $ 120 for this semester. We would like to gift her with some food over the Christmas Season. It would be wonderful if we could give her $ 100 for food. She is still really grieving. It will be an incredibly HARD Christmas for all of them! 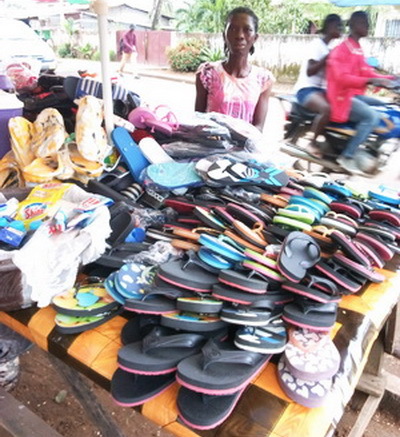 Later we hope to give Tenneh a start up in business so she can provide for herself. 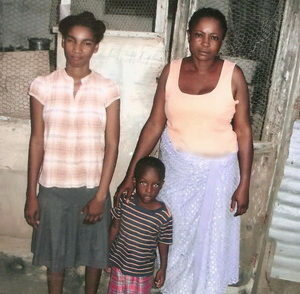 If anyone would like to give towards this family, we would be most grateful. Our previous blog showed other areas to donate for Christmas, if you are looking to give a special gift. If you missed that blog, here is a link to it. Is your family looking to give a Meaningful Gift? Would you like to help someone in need? Here are some great ideas! $ 30 Buys a “new” set of clothes! We only do new at Christmas! David is so excited to get a “wrapped” gift! 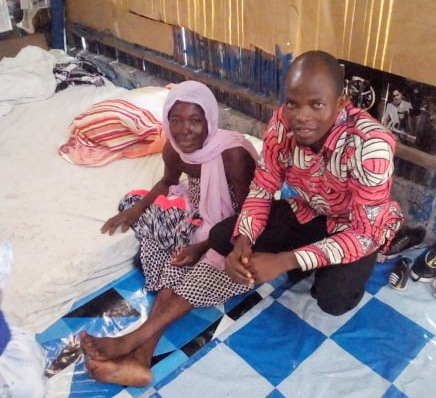 $ 85 for the bed $ 125 for her mattress $ 25 for a comforter $ 5 for a mosquito net. Ma Jessie Toe is so happy to have a new bed with a mattress, comforter, sheets and pillows. 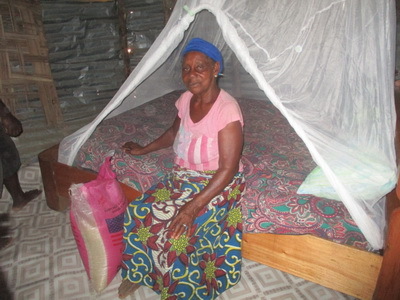 She also has a mosquito net and new flooring. The whole package is $300 plus a bag of rice. 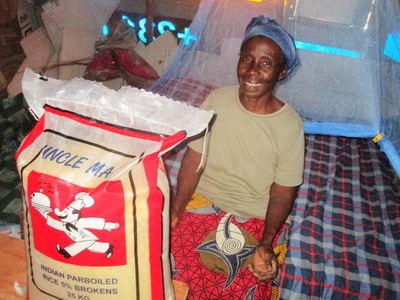 Ma Annie is so grateful for her big bag of rice! She is sitting on her new bed too. Favor just started kindergarten. She is 7. 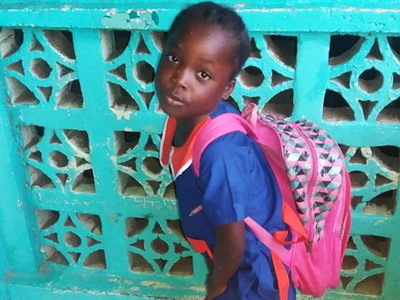 Maybe Mulbah put her own child to school through her small business this year! 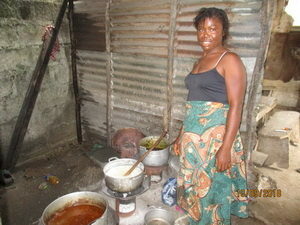 Anita is a single mother in the Buduburam Refugee Camp. She has 3 children. Anita has been here for 20 yrs but has no means to go home. 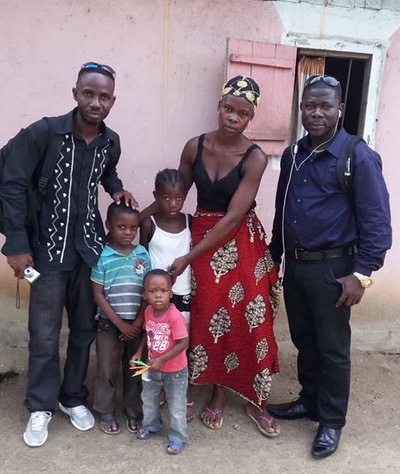 Her relatives in Liberia would help her once she gets home. 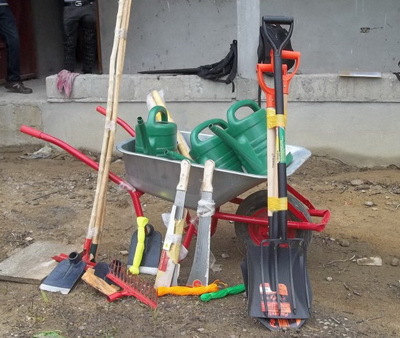 Buy a rake, hoe or shovel $ 15. A watering can $ 10. A wheel barrow $ 60. Work boots $ 10. A cutlass $ 8. Seeds for a large area $ 50. Logged in as Karen Barkman. Log out? 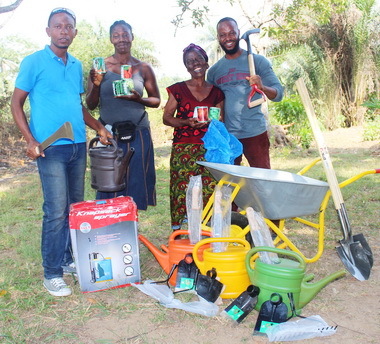 Buy a Rake or a Hoe $ 15, a Wheel Barrow $ 60, a Shovel $ 20, a Watering Can $ 10, a Cutlass $ 10 or a bunch of seeds $ 50 We have a program called GROWING HEALTH which helps so many farmers to grow nutritious food for their families. 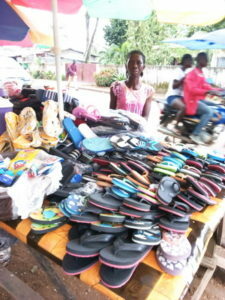 Micro Enterprise is proving to be successful for many of our single mothers in Liberia! We are so proud of their hard work and dedication. Every mom has a story of perseverance for sure! First let me introduce you to Grace Grayeason. Provision of Hope helped her leave the Buduburam Refugee Camp in Dec. 2016. Life was so hard for her there. 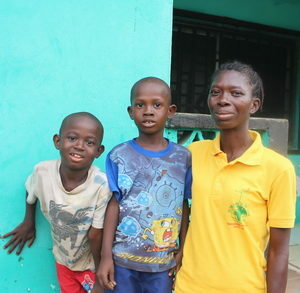 Today she is able to take care of her own family. 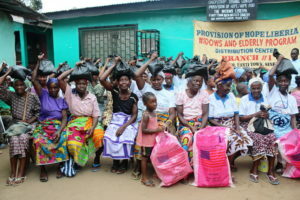 After our moms are empowered we drop their food allowances, and as they progress, the handouts become less. What a thrill it is to see so many making it on their own! 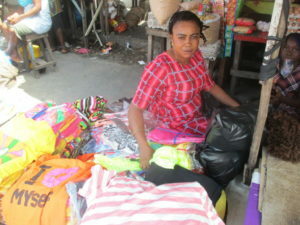 Grace has a profitable business selling used clothes. It’s so encouraging to see her moving forward! Maybe Mulbah came from the Refugee Camp in 2012. She came out of extreme poverty. Today she is progressing well and has surprised us by her efforts! We have known Maybe and her family since 2007. She was part of our Single Mothers group at the camp. 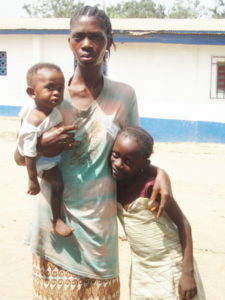 Maybe Mulbah with her small children at the camp. 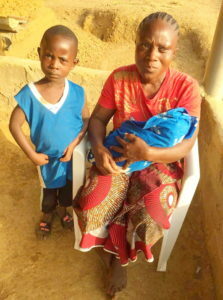 Silas was so malnourished that when he had pneumonia he almost died. Our leaders rushed him to hospital. Maybe sells shoes and flip flops (slippers). With her profits she provides for her family. Maybe has been able to put Philemon to school and pay for study classes. 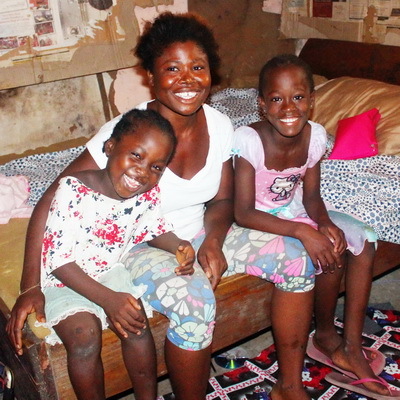 Happy faces in Liberia on our last visit! 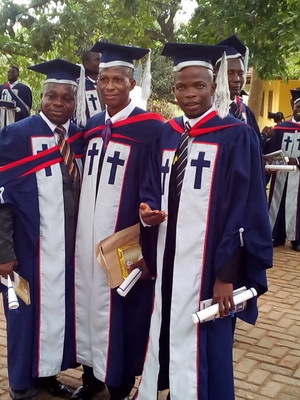 Photo of Maybe with Silas and Philemon. Silas is already in Gr. 2. A healthy, happy boy! Mamie Roberts is crippled and walks with 2 canes. With her optimistic attitude, she runs a small business just outside her home. This helps her to buy food and clothes for her and Hannah. Hannah is in Gr. 4. She is a big help to Mamie. 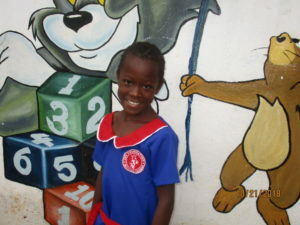 Provision of Hope pays for her school fees. 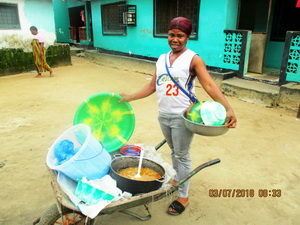 Frances was empowered and started off selling soup and rice, out of a wheel barrow. We bought her rain gear for the rainy season. Today Frances has upgraded to 3 kinds of soups, rice and fufu! She is indoors now, and is . Hopefully we can help her with a few more tables, and chairs. Well done Frances! What a transformation for Frances. She is no longer working the streets. After she invited Jesus into her life, so much has changed!! This is a photo of Frances and her girls at church. 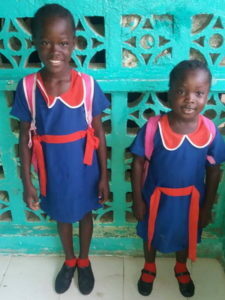 Ruth is in Grade 1 and Favor is in Kindergarten. They are thrilled to be in school. Empowering Mama has changed everyone’s outlook! We start micro business at $ 400 US. At this level we monitor their businesses, but we do not ask for repayment. This is business, at the lowest level. Of course we have a screening process, as to who gets funding. Through empowerment we see parents putting food on their tables, buying medicine for their children, clothes, shoes and some even advance to paying school fees. We are amazed at what they can accomplish once they are empowered! It all takes time. We will put it all together, until we reach $ 400 US … At that point, another one gets empowered! I WANT TO EXTEND A HUGE APPRECIATION TO ALL OUR DONORS WHO HAVE SO GENEROUSLY HELPED US TO MAKE A DIFFERENCE IN THE LIVES OF THESE, AND MANY OTHERS!!! God bless you!! Wow what a difference nutrition makes!!! Today our Director Malcolm Harris sent me new photos of Glory and Grace. Just look at the difference! One year later look at them! This is after they have been getting proper nutrition. 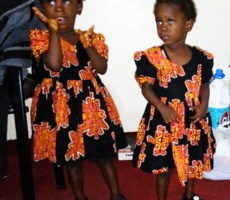 Now these twins are 2 and flourishing! 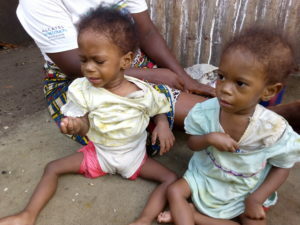 Glory and Grace, when Pastor Malcolm first met them in their malnourished condition last September. 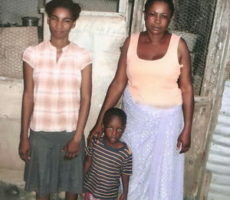 Provision of Hope was able to empower this mother with a small business to be able to sell used clothing. Though her income is small it definitely is a help to this family. Click here to see the post from a year ago. Let’s Save the Children. Mama is smiling. 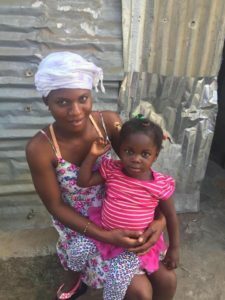 She is so grateful for the help that Provision of Hope has given to her. We have supplied her with another bag of moringa as well as food! “How can there be too many children?